“I had no idea it was going to be like this,” Kris Ray, a construction worker said. Kris Ray arrived in St. Thomas August 17th with a team setting out to rebuild homes after Hurricanes Irma and Maria. But soon after he arrived, things weren’t quite as he expected. “We came down here under the impression we were going to help these people and fix their homes, and then once we get here they start telling us well ya, these are the task orders and this is the way it goes, but we need to one house a day. Just looking at what they needed to have done, we knew immediately that you can’t do these in a day. This isn’t a day type of job,’ Ray added. He said from there things got worse and Ray noticed his paycheck stopped coming in. “Every one that we mentioned we are doing FEMA recovery work was like oh make sure you get your money. It’s like a known secret,” Ray said. And this isn’t the first time it’s happened. Some men went through this same situation just two months ago in St. Croix. They used whatever cash they had left to catch a ferry to St. Thomas. Then they took a job with this contracting crew in hopes of getting paid. Then the same thing happened. FEMA was given over $180 million for the emergency home repairs program – or the STEP Program in the VI. That money was then sent to the US Virgin Islands Housing Finance Authority to disperse out to the contractors. Contractors like Texas based SLS and international American engineering firm AECOM. Then the money goes down, as the workers told CBS USVI News, through sub-contractors CMS and then to DELL Enterprises. But workers said they don’t know where the money got lost. “This is one of the first texts we got when we didn’t receive our check,” Mike Badoud, the crew leader said. USVI News reached out to both DELL Enterprises and CMS for answers. DELL Enterprise representative in the VI Mark Delancy said he never received the pay checks from CMS. But CMS says they sent them out weeks ago. The workers stopped working in protest in the meantime and began to run out of cash fast. They just were just trying to scramble together enough money to buy a plane ticket home. Some of their wives they said don’t even believe their story. “If we don’t get any money in the account just stay there and don’t come home- cause I don’t believe anything you done told me,” Badoud said his wife told him. For the workers, they said the saddest part is that they weren’t able to finish the job for so many recovering families. “We could have done so much more,” Ray added. 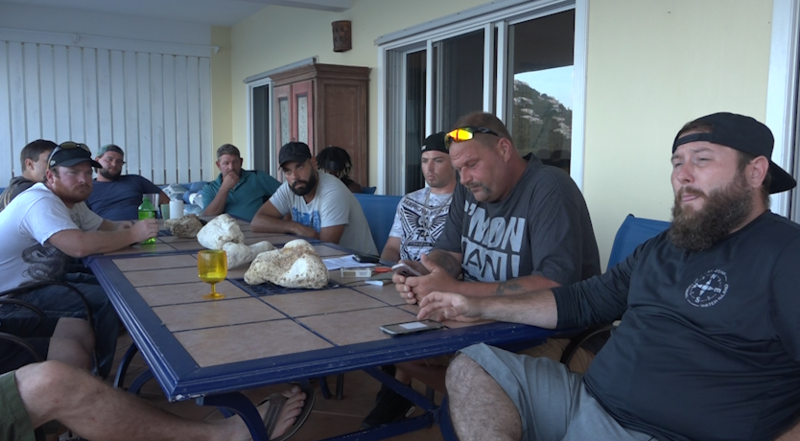 Since CBS USVI talked with these workers on Monday October 1 and made calls to the contractors involved, many of the guys started to get their paychecks and most of them have been able to return home. However, there’s still unanswered questions of what exactly happened here in those few weeks and where the money had gone to. We’ll continuing to look into this story to find those answers.